For many Catholic Milwaukeeans, the Easter butter lamb at the dinner table, sandwiched between ham, mashed potatoes, and Polish sausage, is both an endearing and enduring tradition, much like the Easter Vigil, Stations of the Cross, and a mini-vacation from grade school. Swieconka, translated as “the blessing of the Easter baskets” in English, is a Polish-Catholic tradition that takes place on Holy Saturday. Baskets containing eggs, ham, lamb, horseradish, salt, and bread are blessed at churches. Each food has a religious significance. For example, eggs symbolize life and resurrection and salt represents purification. The butter lamb, or “baranek wielcanocny” in Polish, symbolizes the Lamb of God in the Eucharist. The lamb originated in Eastern Europe, possibly as far back as the Middle Ages. Butter molds were particularly popular among wealthy and aristocratic families. 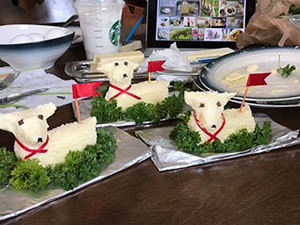 Some Milwaukee families, such as that of Kristen Czajka Zajdel, get in the Easter spirit by making their own butter lambs. “We’ve been making them at home since I was born. Easter is a really big deal in my family,” she says. Zajdel and her sister use a knife to shape the lamb and a fork to add details like curly wool. Cloves for eyes are added, and a small red ribbon, which symbolizes the blood of Christ, is tied around the lamb’s neck. As a finishing touch, a small red flag with “Alleluia” printed on it is added. At first, working with butter as a medium can be a bit awkward, but Zajdel is confident people can get the hang of it. “It’s like working with clay,” she says. The Danish Maid Butter Company in Chicago, founded by Danish immigrant Sivert Kramme, has been producing butter lambs for more than half a century. The company is now owned by Susan Wagner and run by her son, Matt, and daughter Susan. Danish Maid sells 144,000 lambs a year throughout the country, and will also ship them. Woodman’s and Roundy’s are two Wisconsin companies that carry Danish Maid lambs. The company also makes other seasonal butter molds, including Thanksgiving turkeys and Christmas trees. 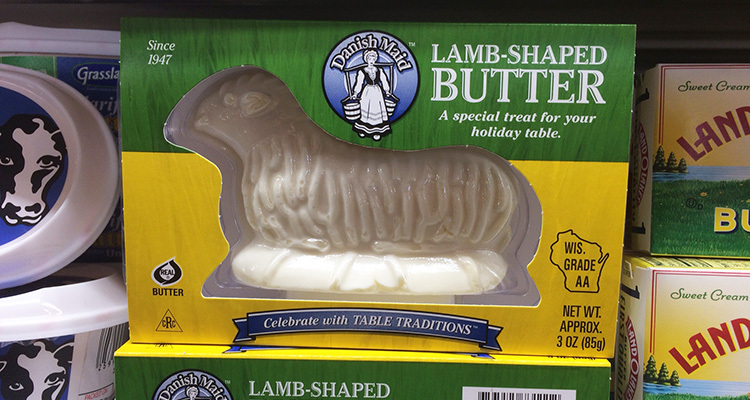 In the 1960s, Dorothy Malczewski popularized the butter lamb on the East Coast, using her family’s butter mold to make and sell the lambs in the Broadway Market in Buffalo, New York. Like Milwaukee, Buffalo has a large Polish-Catholic population. Decorated with peppercorn eyes, a red neck ribbon, and the familiar red flag with “Alleluia” printed on it, Malczewski’s lambs can be found in New York, Michigan, and in other parts of the country. Easter is a busy time in the Buffalo Broadway market, according to Adam Cichocki, who co-owns Malczewski’s with his father and uncle. Cichocki also works as a retail manager for his family’s business, Camelia Foods, which sells Polish sausages and other specialty meats. The three of them took over the business in 2012, when Malczewski’s son and owner, Jim, retired. That tradition is alive and well here in Milwaukee. Here are some local markets that carry this ovine-shaped Easter staple. This Italian bakery molds its own butter lambs. Call 414-327-8555 for availability and prices.